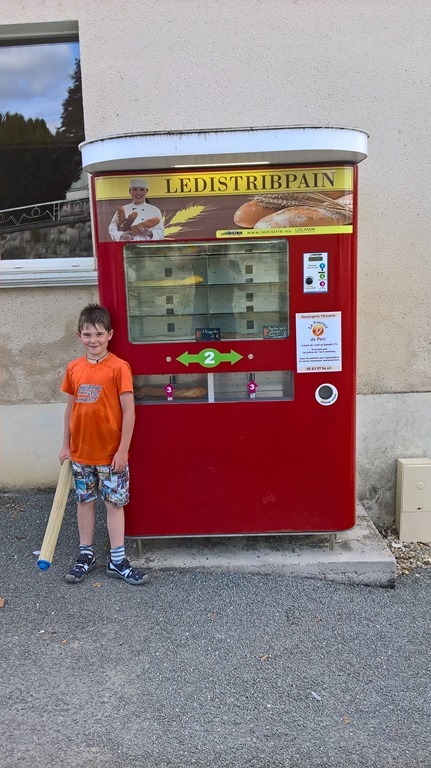 The fresh bread supply in Moncrabeau is rather precarious. Before we set of, we have a bit of a chat and a tour of their boat with an English live aboard couple next door. Their Dutch steal cruiser is lovely turned out and certainly would tick a few boxes with myself. They also recommend that we have to visit the Hotel le Continental in Condom for lunch. As this is the third independent recommendation for this establishment, we are set for a target today. Just in time for said lunch we arrive at Condom, with the Continental just on the left. It turns out that our informants where spot on. The three course meal in the shady garden turns out to be just perfect. We do feel a little underdressed though. Fed and watered we go on to explore Condom. 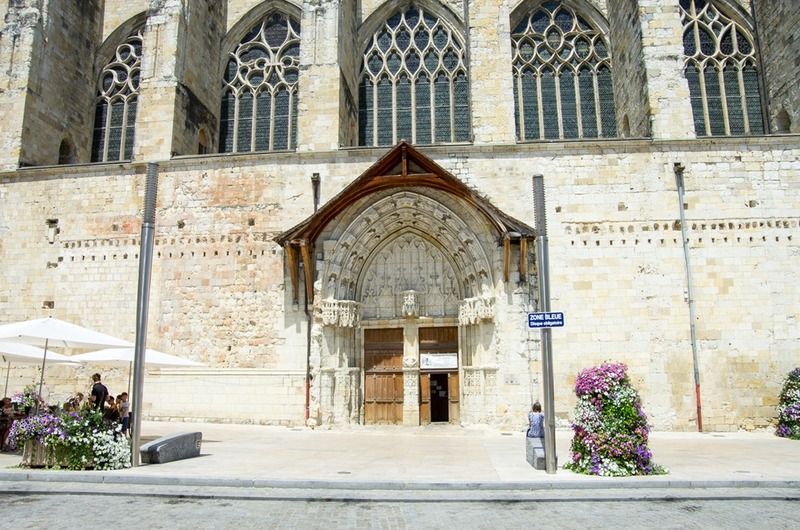 One of the attractions is a signposted tour of ancient doorways. The old houses have been altered so many times, that the doorway is often the easiest way to identify the history of the houses over the centuries. At the tourist office we finally manage to get hold of a fishing permit for our youngest crew member. So he is all legal again. Other than that, the centre of the town is busy, and after taking a few pictures of old stuff, we flee the place. 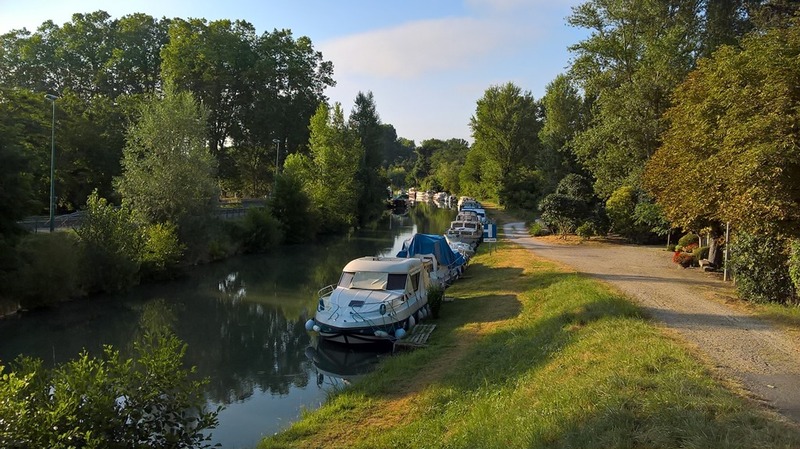 Although it is only another 10 km to the head of navigation at Valence-sur-Baise, we decide to turn the boat around and start the descend of the Baise. With the piscine in Moncrabeau looming as a reward. And so thats what we do. The lad can swim, jump and later fish. The parents enjoying the first quiet evening of the holiday. The sunrays are a bit painful after last night’s fun. Nonetheless we aren’t here for fun. 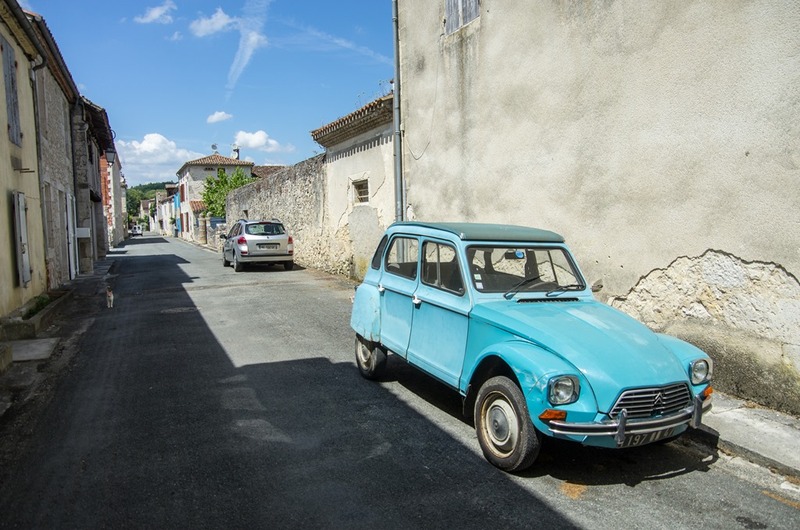 Todays duties await, sightseeing in Nérac. 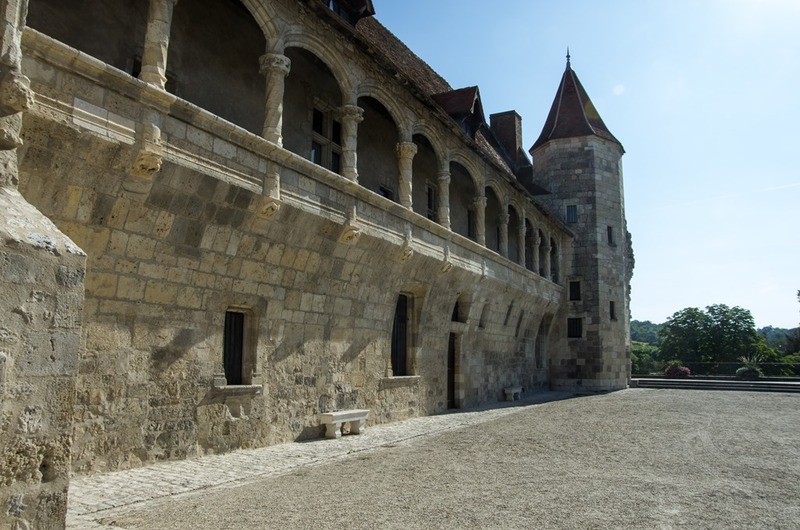 The main attraction is the chateau of Henri IV. 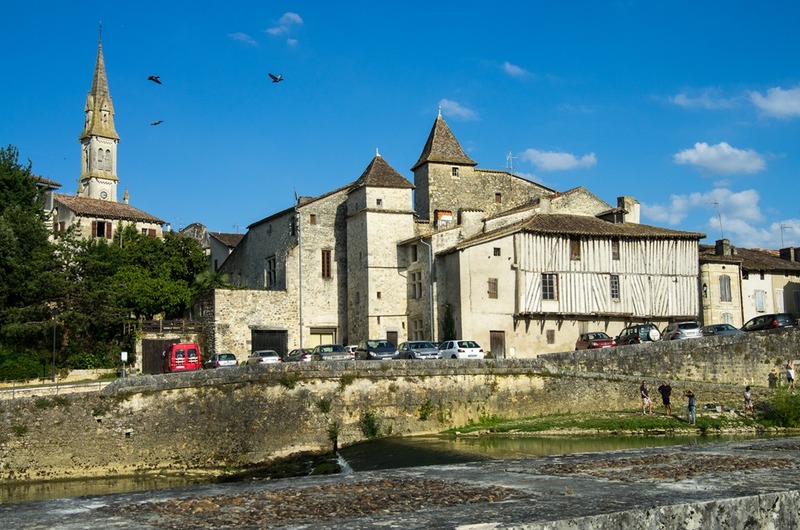 Only one wing survived the century and houses a museum that tells the story of Henri IV. and how he got the first king of the house of Bourbon. But that’s history. 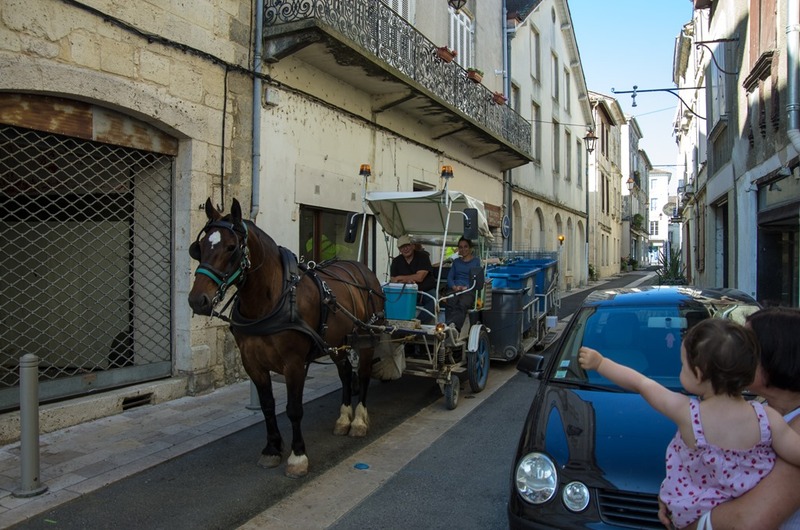 Today the rubbish gets collected by horse power. All the small independent shops instil a shopping spree in the IO and new trainers for the lad have to be sourced. I prefer to retire for a half and a paper to a café. Shoes bought and beer drunk we are heading back to the boat and further upriver. On the way further south, we pass the local maintenance fleet. This serious piece of kit takes the concept of a Wilderness Beaver to the next level. Note the wheels. Lottery win assumed, this might be my next boat. 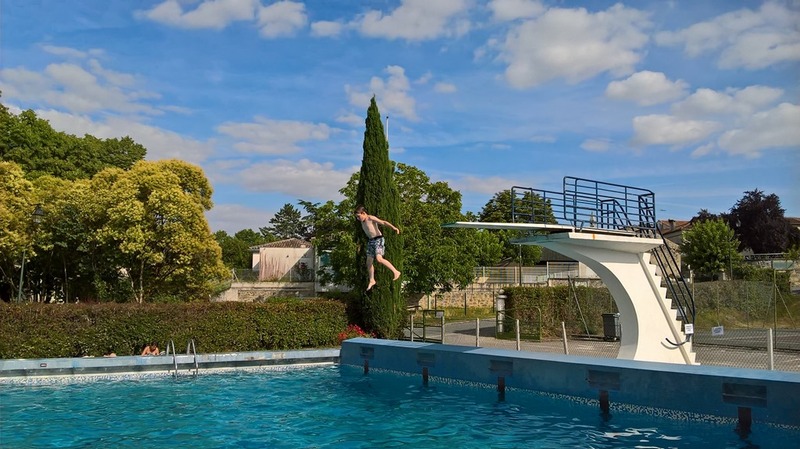 As the lad still refuses to swim in the river we decide to move on to the piscine in Moncrabeau. This doesn’t go without complications as the ecluse Moncrebau is en panne and we have to wait for the roaming lock keeper to come and give the hydraulics a jump start. So I do send the crew ahead to the pool. But there are reasons why the IO is not permitted anywhere near the chart table. From “1st left, then 1 right.” she makes “just forget the instructions, mix up left and right and get generally lost.” Then take the phone to let the captain know that you got lost, don’t know where you are and will she please be given instructions to get to the pool, starting from a mystery location. Eventually the tribe gets reunited at the pool, which is a rather curious affair, fallen out of time. Designed in the Bauhaus style, it is an undertaking that must have always seemed much too grand for such a small village as Moncrabeau. But also slightly worse for wear and tear. The water is clean and cool, that’s all we need. Oh, and they sell ice-cream. And then the lad really surprises us, he does a dive from the-three meter. So very brave. 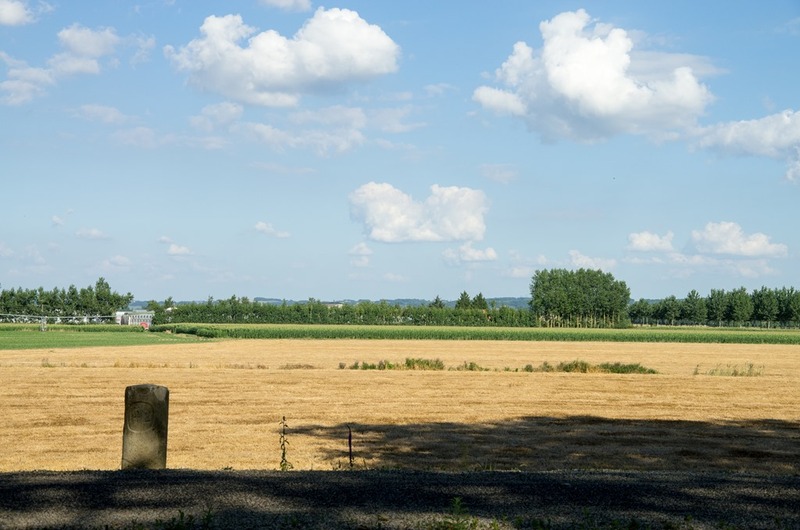 … and the first view to the surrounding countryside for days. Back at the boat, the lad takes up his new hobby of fishing. Though we don’t really want to rely on his success as the sole source of protein. Therefore we fry up some Magret the Canard on the BBQ. Its such pleasure to live in duck country, also the ducks might have a different view on things. Later on we team up the the crew of the penichette moored next door. They give us a welcome hand causing devastating damage to some bottles of red. Its such a hard live. 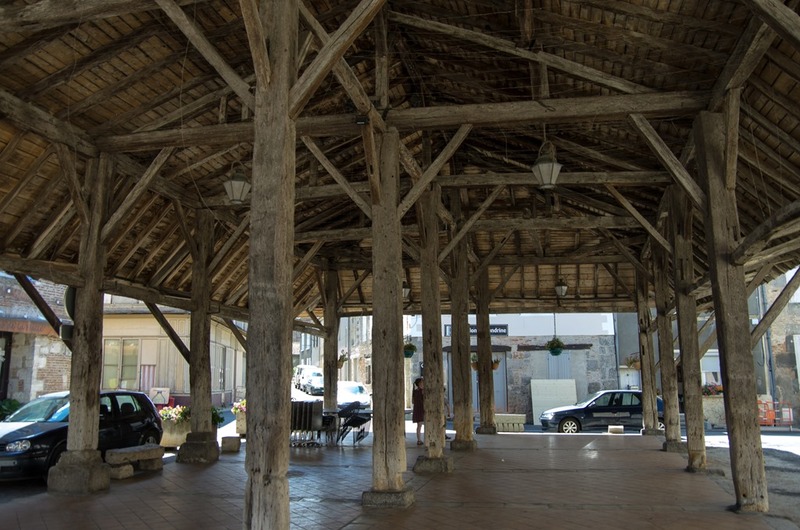 Buzet is a sleepy village, nonetheless offers all the the necessary services, including a large hire base. There is very handy SPAR just a few meters from the bridge, with baker, butcher and other shops only a short stroll up the main road. 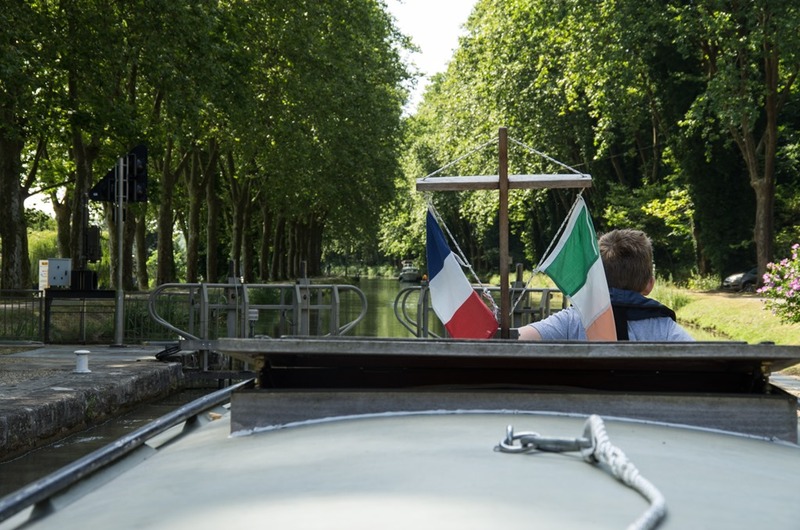 While the Canal maintains his generally south eastern course to finally meet the Mediterranean, we do a sharp turn to port, to enter the double lock that connects the canal with the navigable Baise. At the bottom of the locks one can turn either left or right. 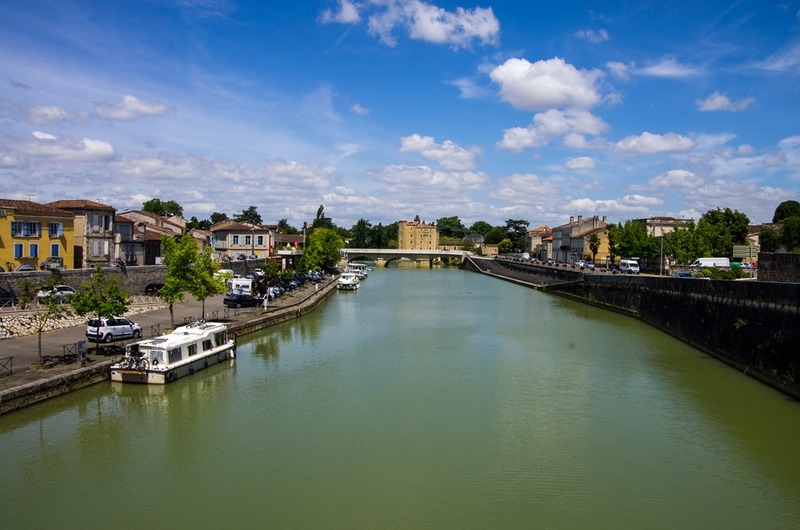 Turning downstream leads to the Garonne and the lower Lot. 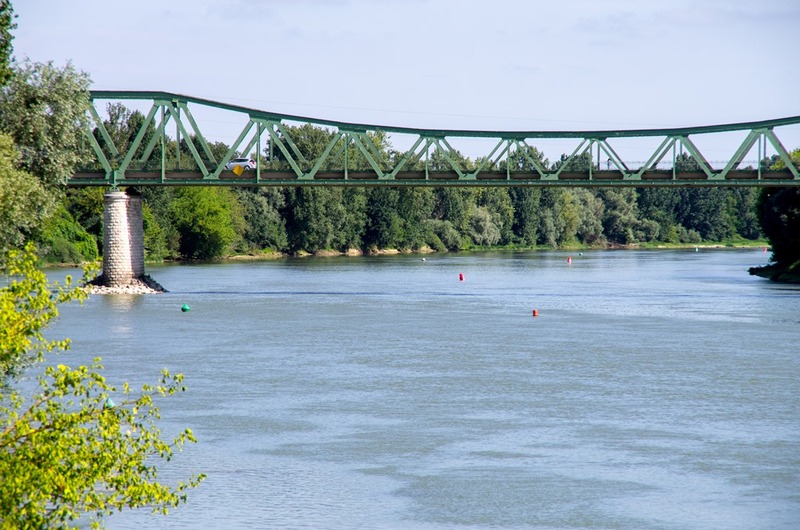 Though this would have been our preferred route, there is not enough water in the Garonne in order to maintain the crossing. Still we want to get at least a sneak peak. Levels permitting St-Léger lock would allow access to the Garonne. 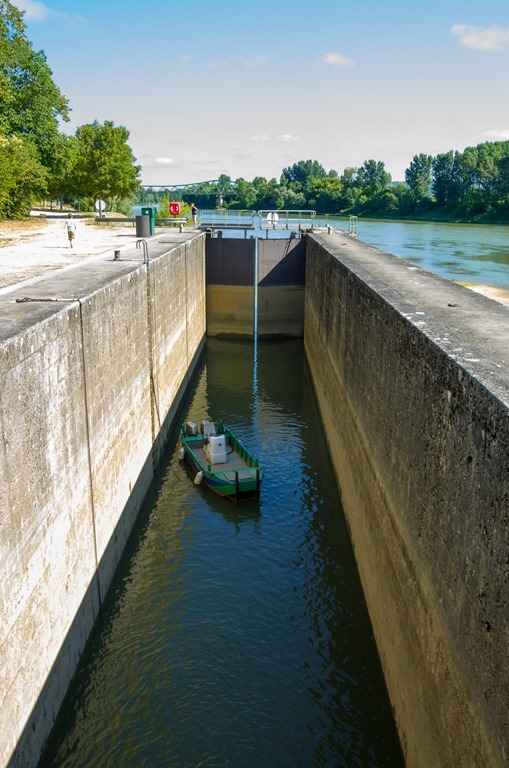 The boat sitting in the lock is the push tug, that would help you coming back against the strong current. To reach the confluence with the Lot five kilometres downstream, a channel has been blasted into the rocky riverbed. 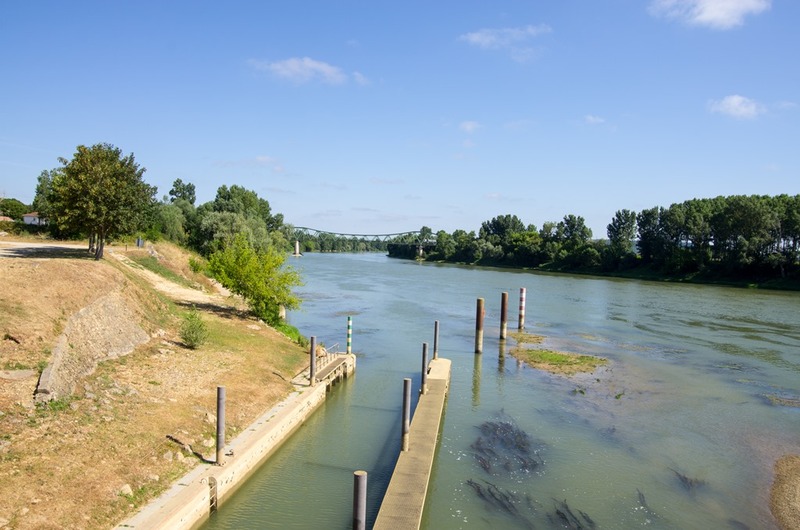 Still the passage is difficult and very much subject to the water levels in the Garonne. The mouth of the lock. This route being blocked for now, we turn around. 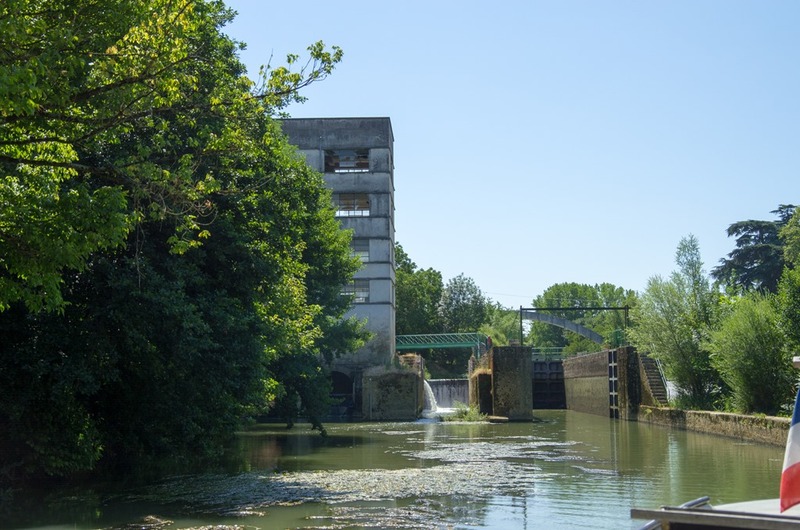 Cruising upstream we pass the Buzet lock with the ruins of the old paper mill. Leaving Buzet finally behind, the scene for the Baise is immediately set. Both banks of the deep river bed are hemmed in by dense vegetation and mayor trees. The boater is completely isolated from the outside world, but although from any views of the surrounding county side. The sediment transported by the river gives it a turquois shine. Otherwise the water is clear and clean and ideal for a swim. The navigation is straight forward without too many difficulties other than some submerged trees. Only the locks themselves need good attention. 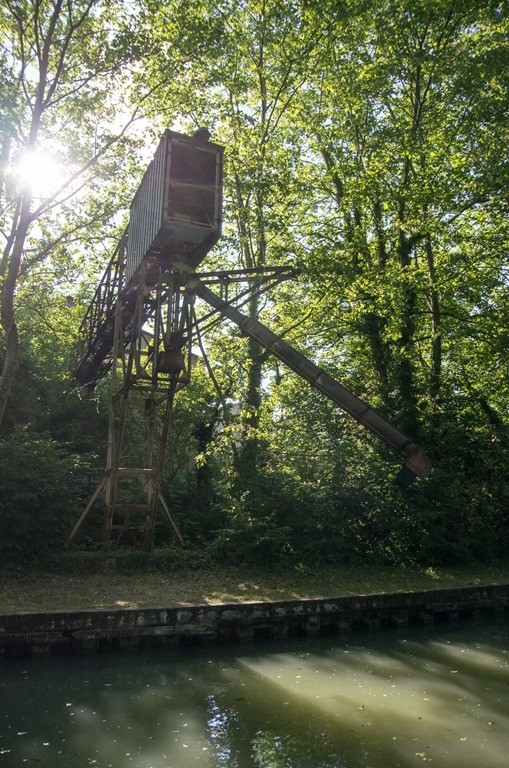 They are operated by a smart card handed over by the lockie at the Buzet double lock. 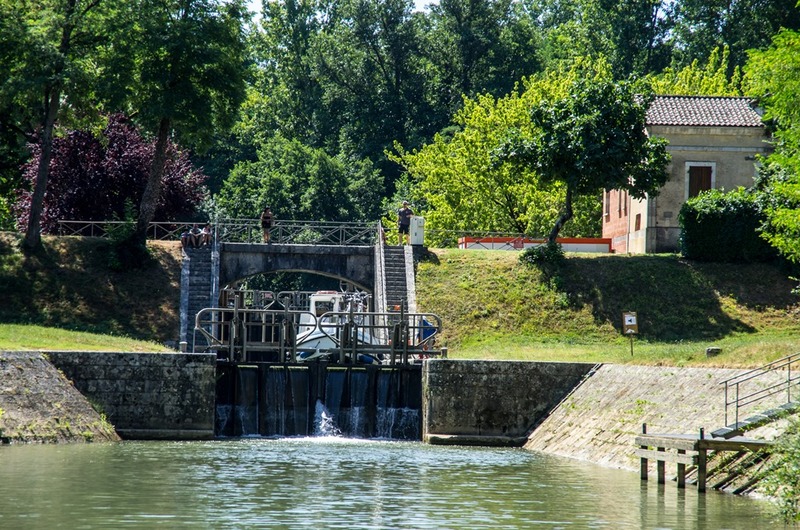 All you need doing is to set out a crew at the landing stages in front of each lock. If the lock gates are open you can drive straight in. If not, the crew inserts the card into a reader and the lock is reversed automatically. Going up, the currents in the locks are quiet fierce and the lock bollards are often in awkward positions. So it is important to secure the boat well and for the crew to stay close to the emergency stop switch. Just in case. Moorings are far and few between. And with one or two exemptions near the main towns and villages along the river. 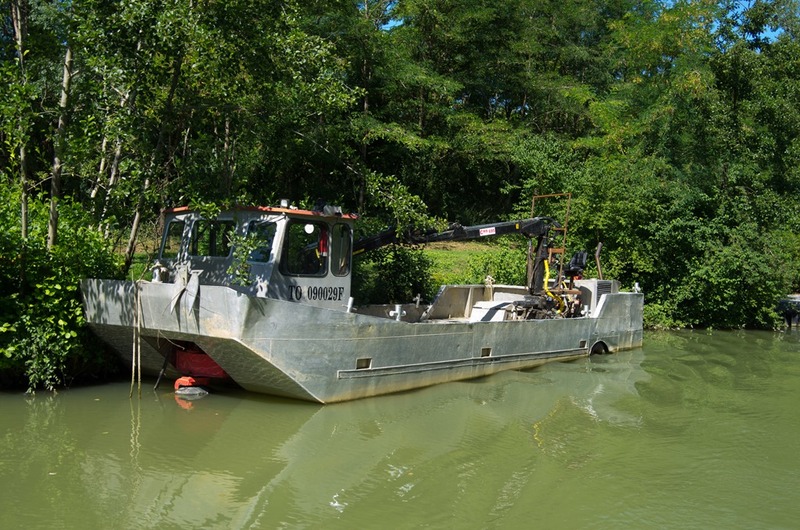 Bank mooring is only possible, if you are prepared to tie to a tree and hope for the best, as gaining access to dry land is almost impossible. Waiting jetties at the locks are even shorter than our little Beaver, so using them for mooring is decidedly uncool. Also the river was absolutely benign during our visit, the water levels can fluctuate extremely fast at times of rain. This rain might even happen far away upstream, so keep an eye on the weather report and a bit of slack in the ropes. 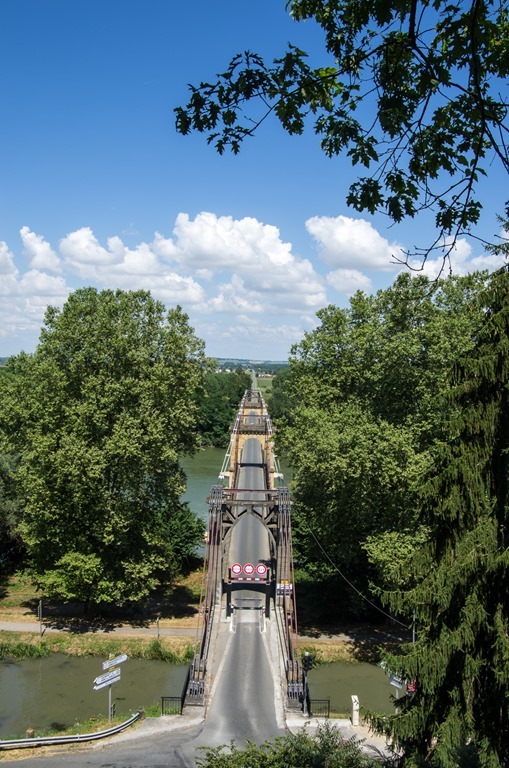 Soon the aqueduct taking the Canal the Garonne over the Baise comes into sight. The first village going upstream is Vianne. 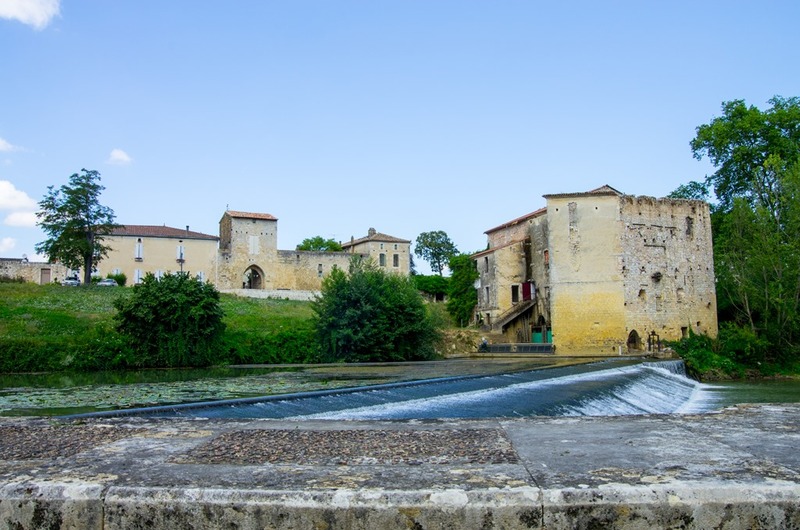 It is a prime example of a bastide, a fortified “new” town build between 1284 and 1287. 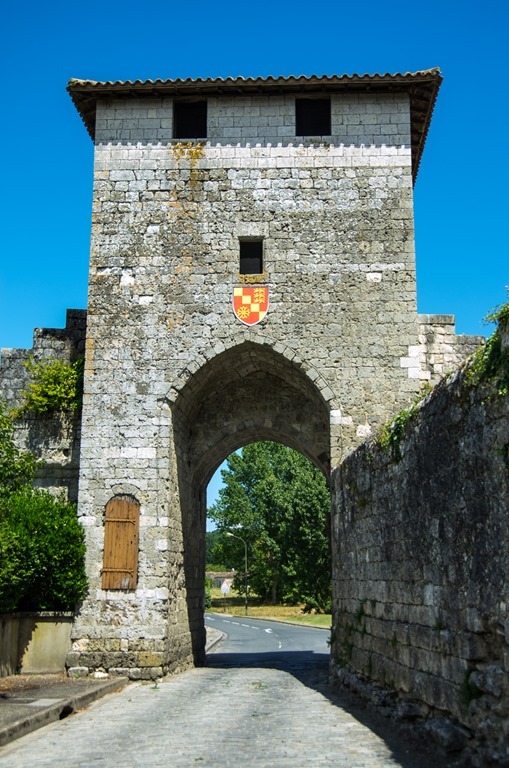 At the time Aquitaine was still part of the English monarchy and the bastides were seen as an economic way of securing this part of the world against the French. Vianne sports a square layout with a big market square at the centre. Its surrounded by 1,2 km of walls, four square towers und a few round towers. The village itself spots some nice alleys with ancient houses. Vianne seen from the lock. 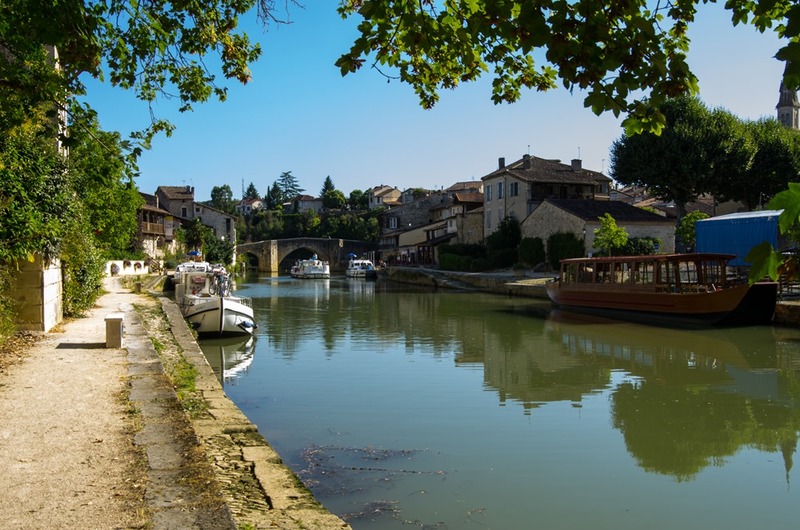 From the generous visitor moorings we stroll into town to take a light (only three courses) lunch at Les Marronnieres under shady trees at the square. To get some post lunch exercise, we explore the village. The whole setting is very laid back. 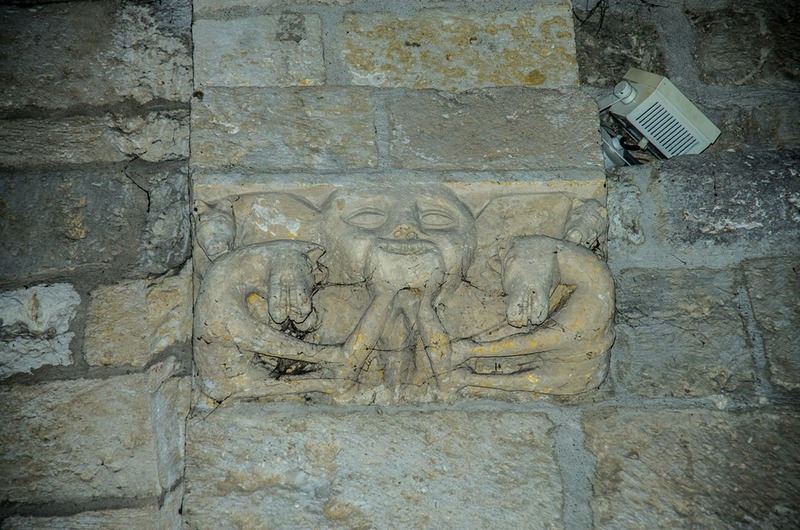 Although I do not know what cheered up this guy found inside the church. But the Force seems to be strong in him. Back to the boat and up the river again. 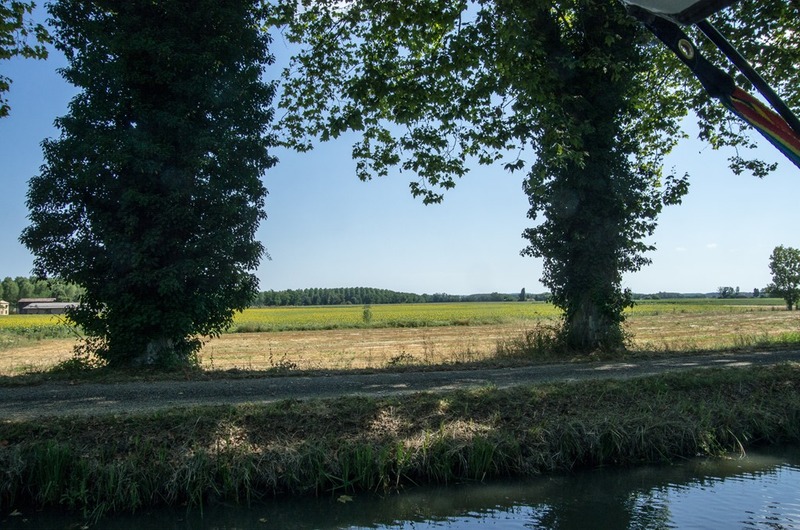 Half an hour later we pass the village of Lavardac, but the mooring adjacent to a tarmaced parking lot and a main road, devoid of an shade, poses no particular attraction. 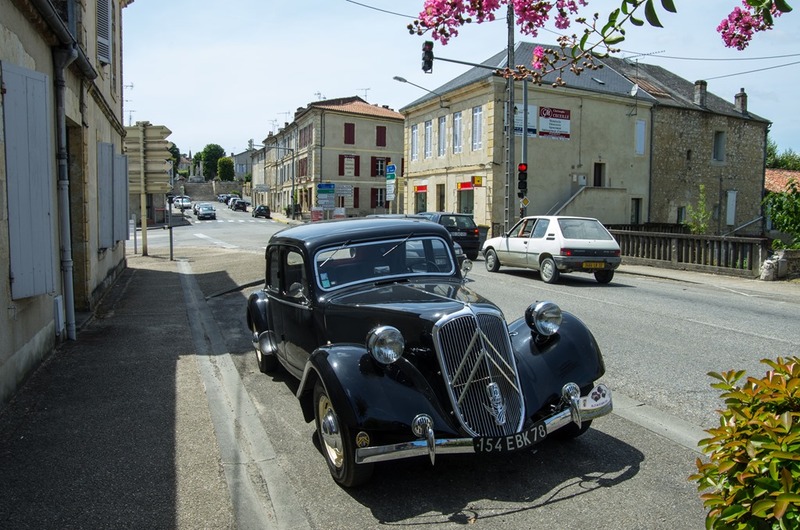 Thus we press on to Nérac. And the right decision that is. First we are greeted by Maurice, the friendly harbour master, artist and Jack of all culture in Nérac. He fills us in to what has do be done and seen while we are around. At the same time a couple with there two dogs join the conversation. It turns out them being Barbara and David, from D.C. and Perth respectively. We invite them on board for a glass of red, as meanwhile it clearly has got drinking time. 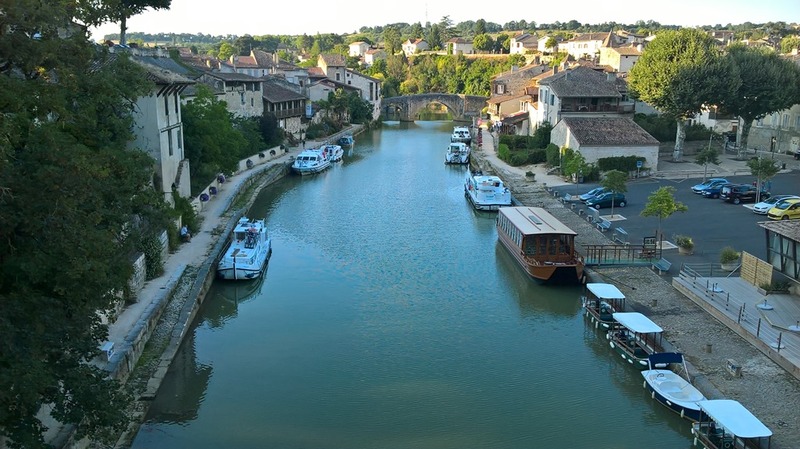 Barbara and David tell us about there lives, how they met after their partners had died and how they bought a house in Petit Nérac, on the right hand side of the river. Low and behold we are invited to join them for dinner later in the evening. Happily we accept. 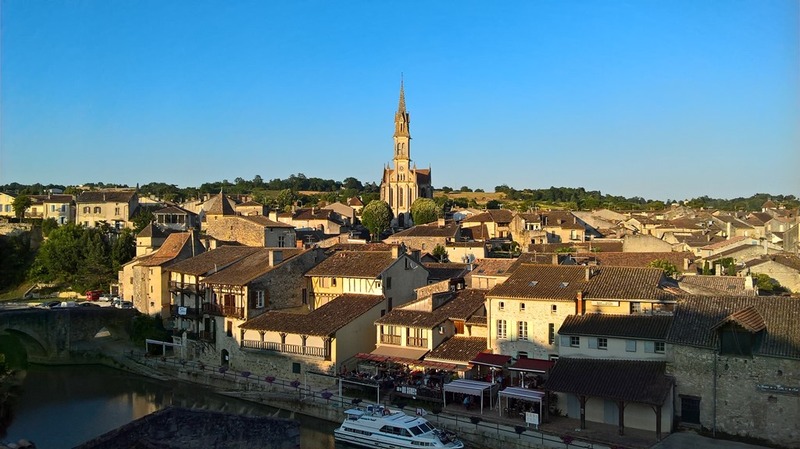 We use the pre dinner time to have a stroll through Nérac, which turns out to be lovely vibrant country town, with loads of independent shops and quite a bit of culture going on. Petit Nérac with Saint-Marc at the centre. We call at our new friends and are treated to a lovely dinner of Foie Gras and Ratatouille in there garden overlooking Nérac. Later there neighbours, also from Perth arrive and we have a long an entertaining evening. So if you read this guys: Thanks a million again. 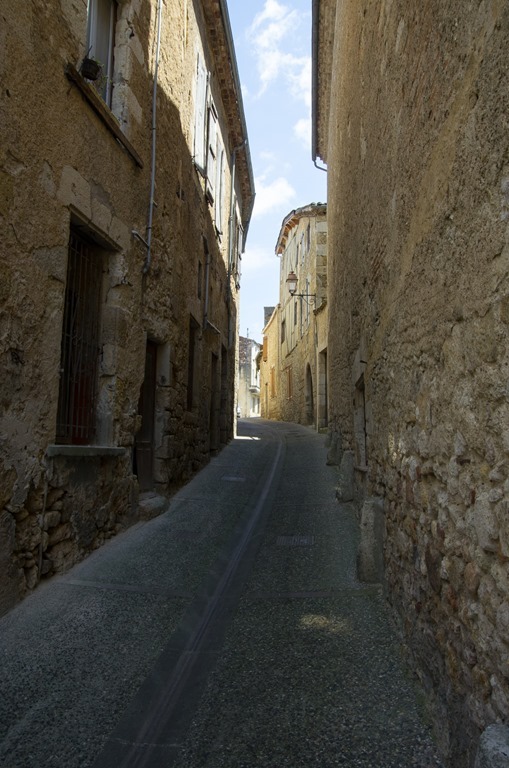 Another climb up the hill gets me into Meilhan to find the Boulangerie. And indeed there is fresh bread to be had, even on a Sunday morning. And while I descend the boreen that acts as the Main Street, the sun already hits with full force. We really do suffer the first few days under the fabulous weather with temperatures close to 40 degrees. We are just not used to it. After breakfast we bid farewell to our new friends and set of in a roughly south-easterly direction towards Toulouse. The first section of canal we are passing, was hewn out of the hill side. 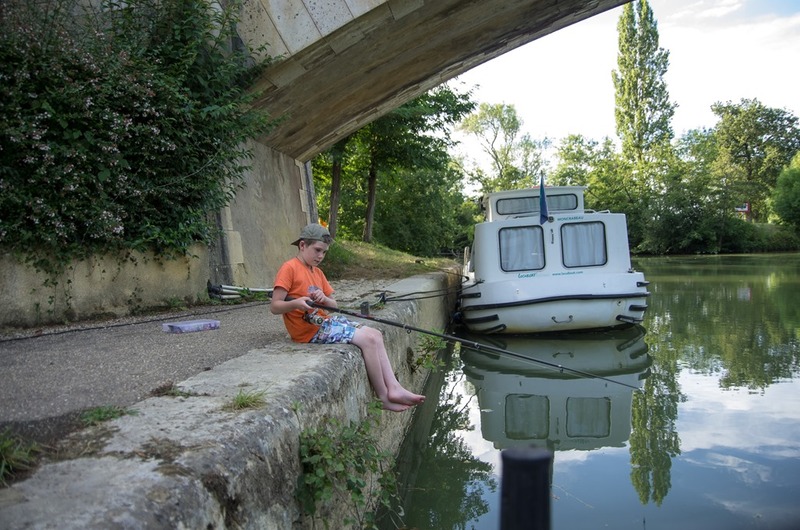 The locks on the Canal de Garonne are most comfortable. 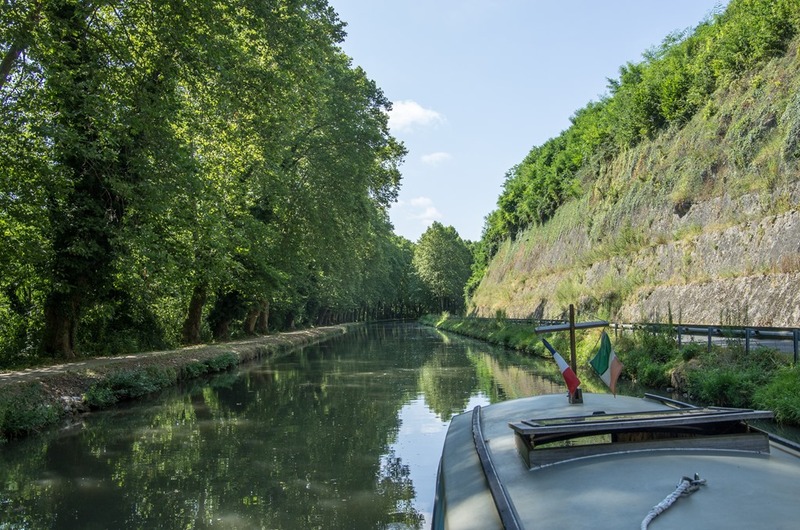 A length of garden hose is suspended from a wire crossing the canal a few hundred meter in front of each lock. One just grabs the hose and gives it a twist. Thus an orange light at the lock starts to blink and the lock is automatically prepared. The gates eventually open and a green light comes on. Entering the lock, a crew member is set of on a set of stair right in front of the lock. The crew secures a rope over a bollard and presses a button to get to lock to fill (or empty). All happens hydraulically, no elbow grease needed. 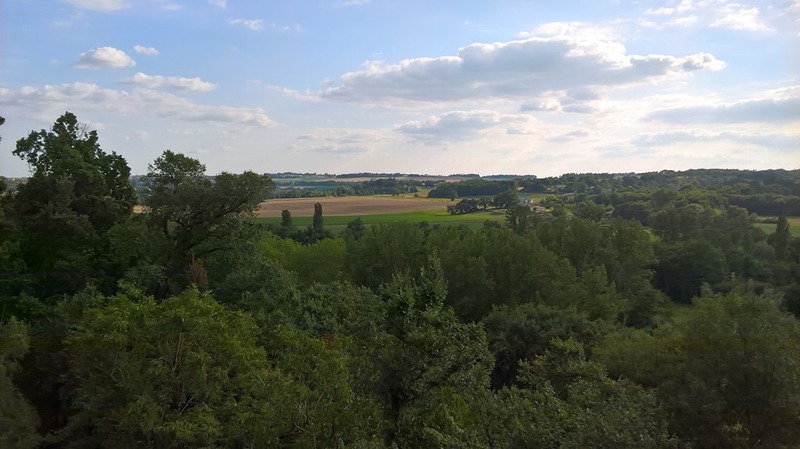 While the Canal more or less clings to the valley side on the right, to the left it offers wide vistas over the Garonne valley. 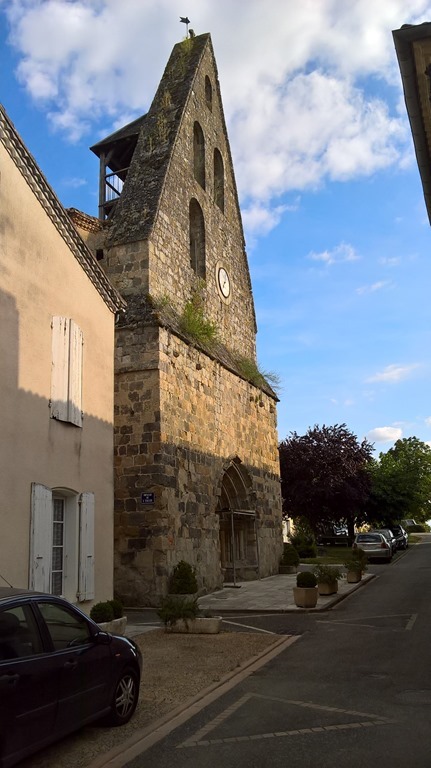 Early afternoon we arrive at le Mas-d’Agenais. We climb up the hill, where the village is rather precariously perched. Being a Sunday afternoon, the whole it is completely deserted. 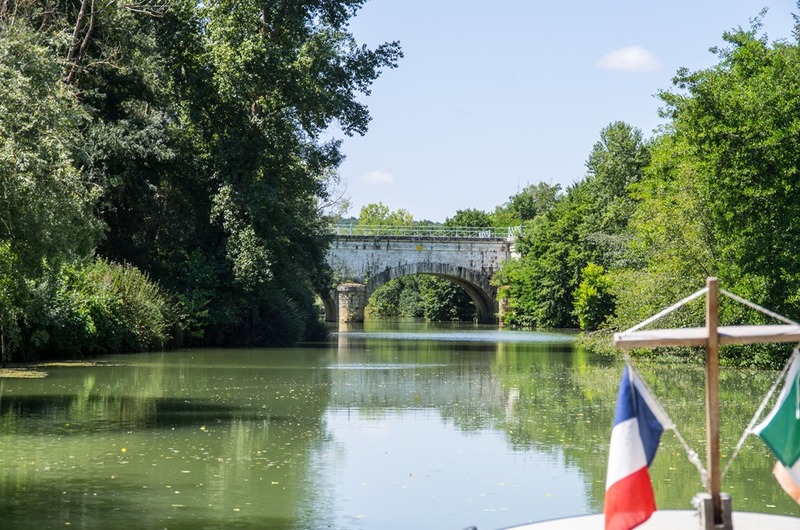 Wide views over the Garonne valley, the canal and a fabulous suspension bridge are offered. The must stop reason is not the view, but Rembrandt. 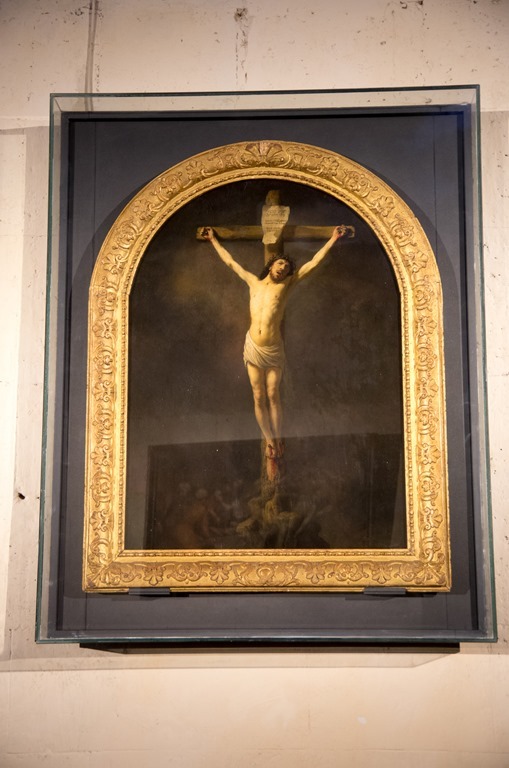 To be precise, a Jesus on the stick painted by the great master, exhibited in the village church. 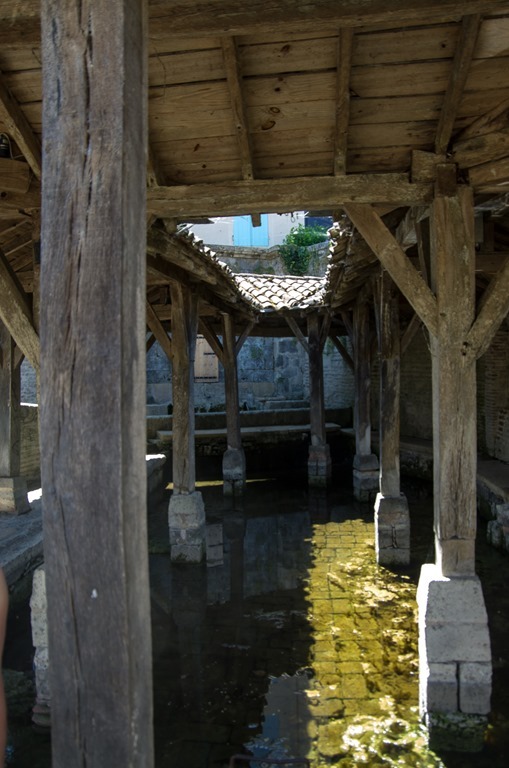 and an equally ancient wash house. No hostelries, no people interrupting our stroll, we retire to the boat and set of further south. The canal was build to Freychinet standards and 300ton barges plied their trade until fairly recently. The last grain barge stopped trading only in the year 2000. This T-Rex near Damazan is a witness of that period. 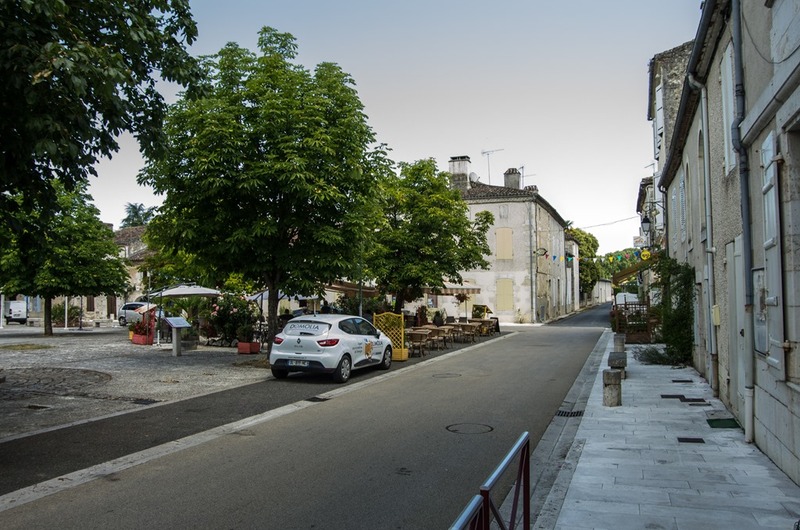 For the night we stop at Buzet-sur-Baïse, as the restaurant Le Vigneron was highly recommended to us. But did I mention Sunday, no people, end of the world. Thus we settle for a frugal meal with some red a-board ARGO.